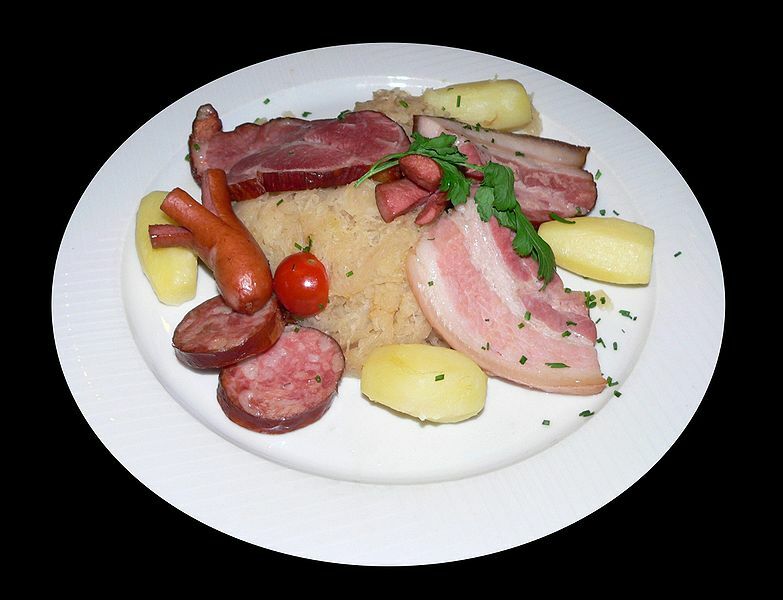 Choucroute garnie (French for dressed sauerkraut) is a famous Alsatian recipe for preparing sauerkraut with sausages and other salted meats and charcuterie, and often potatoes. Left: A typical choucroute garnie. Although sauerkraut is a traditionally German and Eastern European dish, the French annexation of Alsace and Lorraine following the Peace of Westphalia in 1648 brought this dish to the attention of French chefs and it has since been widely adopted in France. In principle, there is no fixed recipe for this dish - any preparation of hot sauerkraut with meat and potatoes could qualify - but in practice there are certain traditions, favourite recipes, and stereotypical garnishes that are more easily called choucroute garnie than others. Traditional recipes call for three types of sausage: Frankfurt sausages, Strasbourg sausages, and Montbéliard sausages. Fatty, inexpensive or salted cuts of pork also often form a part of choucroute garnie, including ham hocks, pork knuckles and shoulders, back bacon and slices of salt pork. Other recipes call for fish or goose meat, but this is far less typical. The sauerkraut itself is usually heated with a glass of Riesling or other dry white wines or stock, and goose or pork fat. In some recipes, it may also be cooked with chopped onion and sliced apples. Every traditional recipe includes black peppercorns, cloves, garlic, juniper berries, onions, and potatoes; most include bay leaves and wine. Like cassoulet, pot au feu, and so many other examples of France's regional cuisine, choucroute's origin is in a traditional, inexpensive dish, but grand versions (such as Choucroute Royale, made with Champagne instead of Riesling), and grand ingredients (such as foie gras and wild game) also exist. Choucroute garnie is available throughout France in canned or microwavable ready-to-eat form. A Hungarian version of choucroute garnie includes stuffed cabbage leaves in addition to the other ingredients. Shredded cabbage can also be added along with the sauerkraut in order to produce a somewhat less acidic version. Heat the butter in a pan, add the bacon and gently sauté until lightly coloured. Pour over the white wine and white wine vinegar and add both bouquets garnis. Cover with a tight fitting lid. Gently simmer the cabbage until most of the liquid has evaporated, then add honey and check the seasoning. Serve with grilled continental sausage or simmered ham hock, carrots and potatoes.